Anthony Sorrentino is a graduate from the Center of Creative Studies in Detroit with a Bachelor of Fine Arts, majoring in Illustration and Graphic Design. He is happily married and a father of three. He started training in the Genbu Kai Organization in 1991. Today he is a dedicated student, a Blackbelt holder in Karate-Do and Kobudo, and a teacher under Shihan Fumio Demura. During the 90’s he was an enthusiastic competitor in the Genbu-Kai, traveling across the U.S. from New York to California and many places in between. He is an East Coast Genbu-Kai champ many times over and in 1999 was awarded as a Triple crown champion by Fumio Demura in the Minnesota Championships. Today, he directs his focus towards teaching at his own dojo. He opened his Dojo in 2001 under the Genbu-Kai organization with his Sensei’s blessing. Holds a Nidan in Shorinji Kenpo from his college days in Japan and now after many years of dedication holds Nidan in the Genbu-Kai as well. Mr. Itoh is a valuable asset to our dojo as he gives us insight to the language and cultral differences of Japan. His wisdom and patience helps guide us in the right direction. Our newest Shodan Black Belt, but don't underestimate his skill or experience though. A student since 2008 and patiently assisting Sensei Sorrentino in alomost every class for the past 3 years. 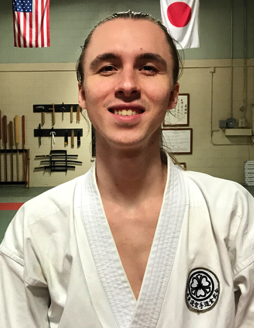 Senpai Josh is knowledgeable and proficient in Shito-Ryu Karate, Kobudo and Batto-Do. He has proven to be dedicated and a reliable instructor.